Although Cocoa has a class for parsing XML i.e NSXMLParser and if XML parsing is needed in a Cocoa application I would recommend to use NSXMLParser, But there could be a application which is not Cocoa based and needs XML parsing support through scripting. For any such scenario we can use AppleScript to parse XML content. The following code will demonstrate the parsing of a sample XML. Have you ever wanted to copy some songs of your iTunes library onto a USB key? Launch the following script with Script Editor for example. There isn’t a (Mac) App for that? Create one! Quite a while ago I wrote about Automator. That post dealt primarily with automation. Today we’ll take another look at this mighty tool, but with a (little) bit different focus. I’ld like to show how to start up stuff – the convenient way! Let’s start with a real-world-scenario. Occasionally I want to establish a SSH-connection to my Raspberry PI. To do that I have to start up the Terminal-App and than – very exhausting (I admit I’m writing about first-world-problems here…) – have to type in the command “ssh pi@raspberry” (For this to work you have to map “raspberry” to the IP of your Raspberry PI. The easiest way to to that is to edit “/etc/hosts”.). There’s got to be a better way! While AppleScript’s Script Editor has long had a built-in function for wrapping or unwrapping code with comment tags, for some reason this seems to be missing in Xcode. Install the Service by double-clicking on the downloaded .workflow file and clicking through the dialog boxes. When it’s installed, you can assign it whatever hotkey you want in System Preferences | Keyboard | Shortcuts. 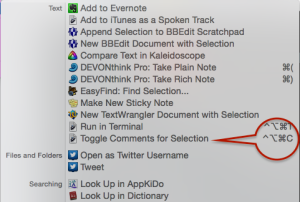 If you want to use it for languages that have different comment tags you can adjust the code in Automator. Likewise, it would be fairly simple to have the script detect a number of different tags and respond appropriately, but here I’ve just stuck with the /* …. */ tags. The term “agile” now signifies whatever folks want it to. It’s a term that has achieved widespread recognition within the software development field, and with that recognition, dilution to the point of near meaninglessness. Agile was (circa 2001) a reaction by a bunch of experienced, senior developers to both the conventional “heavyweight” and widespread “cowboy coding” approaches to writing software prevailing at the time. Forget about talk of incremental, iterative approaches. Forget about “inspect and adapt”. Forget about “embracing change”. Forget about “quicker development of higher quality software”. Forget about “earlier realisation of investment”. Forget about methods or frameworks like Scrum, Kanban, DSDM, XP, etc.. And forget about practices like sprints, wall-boards, and the whole practices nine yards. 1st reason – Do you know your process? 2nd reason – Too manual process! 7th reason – What about RCA?